This is essential to begin proper growth, health, and appearance of your landscape for the season. A landscape clean-Up of your entire property from cultivating the beds to the first lawn cutting and initial edging of your property is completed at this time. Starting off on the right foot is important in maintaining your lawn in the prime condition. 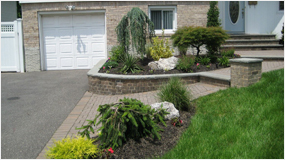 Our concern is to maintain your landscape in top notch shape. Once a week we will cut your lawn, trim all edges, cultivate the lawn beds and clean your driveway and walks. We leave the premises with no unsightly lawn bags because as a full service company, we take clippings with us. Adequate lawn nutrition is essential to developing and establishing a healthy, vibrant landscape. Routine and proper fertilization applications will supply the needed nutrients unavailable though the soil and help to prevent weeds, insects, and disease. The Program which best suits your lawn needs can be determined and explained by Lakeview Landscaping specialists. Providing root nutrients, combined with insect and disease application will spur growth and keep trees and shrubs vivid with health and color throughout the season. Proper pruning respects beauty and dignity, and helps maintain the defense system against disease. Pruning, one of the most beneficial tree and shrub practices, is the removal of dying and dead parts for the benefit of the tree and shrub growth and appearance. The white grub can do a great deal of damage to your lawn, as they feed upon its root system. The unsightly brown patches created by the grub can be curtailed utilizing chemicals and thus limiting damage to your lawn. The purpose of lime is to counter balance a high acidity level in the soil. This will give your lawn an overall superior quality by promoting better growth. Dead grass laying on the top level of your lawn can delay and even stop growth of new seeding. A power raking will pull out those top layers and provide your lawn with the initial stage of relief it needs to grow. Aerating, according to many landscape experts, is recognized as the best procedure for most problems caused by thatch build-up and hard soils. A core aeration will loosen thatch and soil to improve a flow of air water, and fertilizer to promote a healthier, thicker, greener lawn. Lakeview Landscaping offers a wide variety of flowers for all different seasons. Impatiens, Tulips, Marigolds, Chrysanthemums, Cabbages and more. Add that final touch to beautify your landscape, large or small areas.